About 2005 or so I started roasting single origin coffees in my wok in my kitchen. I quickly outgrew this and purchased a small electric roaster. In 2012 I made a major upgrade to a handbuilt 500 gram commercial drum roaster. With this beautiful stainless steel machine, I can roast up to 4 lbs of coffee per hour, while logging time and temperature in my computer. I generally only roast during the summer months, as it is a great activity to enjoy on the back patio on a warm day. 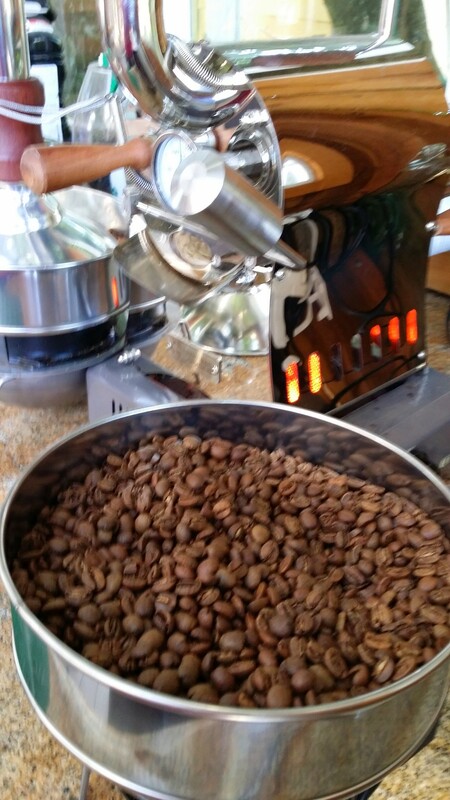 I primarily roast single origin estate coffees that feature fruity floral notes. My favorite is a Tanzania Peaberry with a light roast. My Technivorm Moccamaster was made by hand in The Netherlands. This brewer creates the best extraction possible by brewing at exactly 200 degrees faranheit.